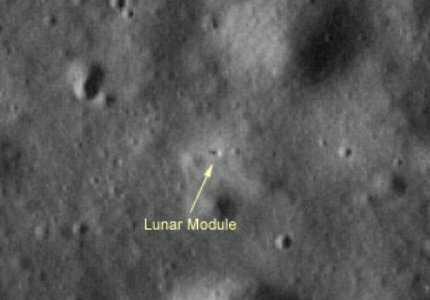 One of the questions regularly sent to Inconstant Moon asks whether it is possible for the Hubble Space Telecope (HST) to see the Apollo lunar modules on the Moon's surface. The disappointing truth is that it isn't. Although the HST is a powerful instrument, and has no atmosphere to contend with, a lunar module at 376000 km is just too small an object at too great a distance. Hubble has been aimed at the lunar crater Copernicus, and although the image was very detailed the theoretical limit of resolution is about 85 metres - not nearly small enough for the task. There are two ways to improve this resolution. One is to use a larger telescope. NASA plans to replace the 2.4 m HST with a larger successor, the 6 m James Webb Space Telescope, in about 2010. On Earth, the twin 10 m Keck telescopes on Mauna Kea, Hawaii and the European Southern Observatory's four 8.2 m Very Large Telescopes (VLT) at Cerro Paranal, Chile have begun using adaptive optics - computer-controlled mirror systems to cancel out atmospheric turbulence. But still none of these is large enough. The European 100m Overwhelmingly Large Telescope (OWL), planned for around 2015, could theoretically cope, but Moon is an unlikely target for this instrument. The other solution is to get closer. This photograph was taken from the Apollo 17 Command Module, orbiting about 100 km above the lunar surface (about ¼ of the altitude of the International Space Station above the Earth), and is the remarkable climax of a sequence of progressively more detailed lunar surface images on the website "Exploring the Apollo Landing Sites". It shows a roughly 1 km wide area of the Taurus-Littrow valley in the Mare Serenitatis, in which the Apollo 17 lunar module and its shadow can clearly be seen. Image: NASA, Daniel Durda, Southwest Research Institute.